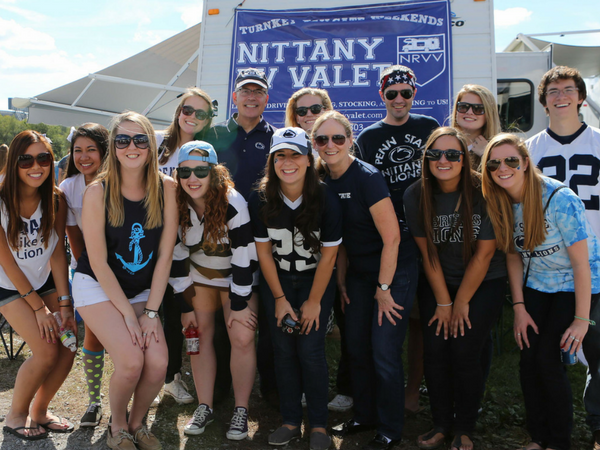 We love the tradition and pageantry that surrounds Penn State home football weekends – especially the tailgating experience in an RV. We started with the idea that RV owners who drove their RV to every home football game would find it more convenient (and a lot less expensive) if they brought their RV at the beginning of the season and left it in Happy Valley. We would handle the parking, cleaning, and servicing between games. We quickly discovered other customers wanted to share the home football tailgating experience with family and friends but didn’t own an RV, weren’t experienced operating an RV or didn’t want the hassle of renting, stocking, servicing, set-up, cleaning and driving to and from the stadium. That’s when we decided to offer “Turnkey Tailgate Weekends™“. Our clients bring personal belongings, food, beverages, and spend the weekend in the surronded by other fans with all the comforts of home in a tailgate ready RV. They leave the driving, cleaning, stocking and parking to us. Sharon is a commercial recreation and marketing expert in charge of reservations and sales. Cathy and Dave are responsible for operation logistics and onsite customer service. Together we make a dynamite team! We are committed to providing the best experience possible for our clients. We will do anything within our power to make their “Turnkey Tailgate Weekend” an enjoyable and memorable experience.